Ward W. Briggs, Jr., in his foreword, and Michele Valerie Ronnick, in her introduction, provide the historical and intellectual context for this pioneering work written by a nineteenth-century African American classicist. The introductory text includes Greek to English and English to Greek exercises that drill Greek grammar and vocabulary as well as readings from Xenophon’s Anabasis and Memorabilia. After decades of tireless scholarly advocacy, Michele Valerie Ronnick has succeeded in returning Scarborough to the limelight and to the minds of forgetful contemporary scholars and thoughtful people of all kinds. The publication of William S. Scarborough's Greek textbook chronicles a scholarly first for an African American classicist. He believed that mastery of a language foundational to black intellectual distinction and relevant to a serious study of the New Testament, a text that informed black religious belief, required the trained eye of an African American scholar. The re-publication of the Scarborough book is a scholarly benchmark that resonates into disciplines beyond the classics. It is not only an honor but a delight for me to join in celebrating the work of William S. Scarborough, a true pioneer in promoting the study of Hellenism in troubled times that sadly remain troubled even today. The world owes him a permanent place in the history of humanistic ventures. William Sanders Scarborough is a towering figure in the history of American education. To see his First Lessons in Greek is like entering his classroom—where he used the newfangled 'blackboard' and praised it highly—and so recovering a moment in America's ascent to justice through education. When William S. Scarborough—a man born into slavery—embarked on the "daring" act of publishing the first classics textbook by an African American, he hoped to make Greek a “living language” for his students at Wilberforce University. He endeavored to fortify church-sponsored higher education with the intellectual tools that would foster student engagement with a broad array of ideas. In reintroducing his text, Michele Valerie Ronnick has enabled us to engage a pivotal resource in nineteenth-century African American education that shaped both the history of Black classicism in particular and of American philological studies in general. When published in 1881, First Lessons in Greek was just as much a political broadside as an introductory textbook. Determined to put to rest a notorious dictum attributed to John C. Calhoun in which he posited that blacks could not grasp Greek syntax, Scarborough produced an impeccable two-semester vade mecum to the ancient language. We all owe a debt of thanks to Michele Valerie Ronnick for bringing this exquisitely rare volume, crucial in the intellectual and civil rights history of America, back to the light of day. We have here not only a useful textbook of Greek grammar and important passages for beginning students (Anabasis, Memorabilia), but a publication that preserves an important moment in American letters for present day learners. Phillis Wheatley, Frederick Douglass, and William Scarborough, as curious anomalies to the onlooker, be they Thomas Jefferson, William Lloyd Garrison, or Bishop H.M. Turner, are not that far away in our collective past. First Lessons in Greek benefits all of us in the twenty-first century and deals another blow to white supremacy. 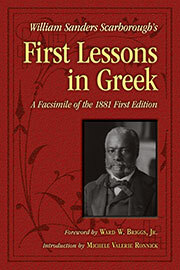 First Lessons in Greek, published in 1881, was a landmark in scholarship, and was used by students, both white and black, for more than a generation. Scarborough was among the foremost American intellectuals of the late 19th and early 20th centuries, and his presence was felt not only in classical studies but also in the worlds of politics and religion. Professor Ronnick's introduction places both the work and the man in historical perspective and rescues him from an ill-deserved obscurity.